When you’re traveling, half the fun is seeing the sights — museums, historical locations, that sort of thing. But more and more of those sights are trying to make money off of tourists: they charge entry fees, mark up gift-shop items and offer outrageously priced cafeterias. 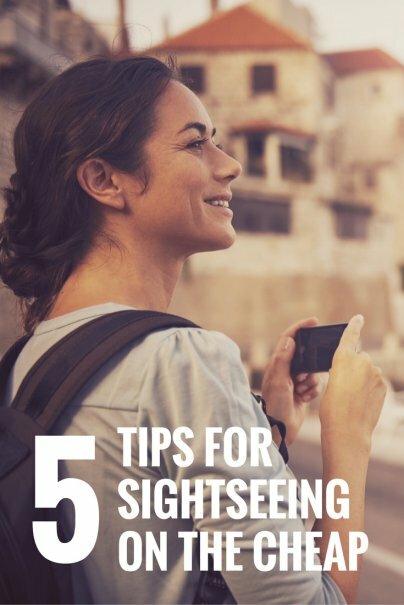 There are ways to keep your sightseeing on the inexpensive side, especially if you have an opportunity to plan your itinerary ahead of time. Museums are one of my favorite touristy sights — a national museum brings together a wide variety of exhibits that can show large portions of the country that you’d never get to see otherwise. Consider the Smithsonian Museums in Washington, D.C. They’re run by the U.S. government, in a round about way, so entry to the museums is free, just like visiting the local monuments. There are more exhibits than you can go through in the average trip, too. Compare that to Mount Vernon, a popular tourist destination just outside of D.C. — there’s perhaps a couple of hours of entertainment, and an adult ticket costs $13. If you aren’t visiting something that a lot of tourists aim for, you’re more likely to avoid those costly entry fees and gift shops. I learned this rule young, hiking in the Garden of the Gods. While entry to the park is free, the commonly used trails practically lead inside of the Visitor’s Center and its gift shop. Instead, heading on to the less popular trails offer more opportunities to explore and climb, and you’ll wind up with just as good of a view of the park. Those organizations in charge of bringing tourists to an area can be your best bet to find coupons and special deals. In Ireland, the local tourism offices in each town can often connect you with a deal for just about anything — I was with a group of students traveling around and they managed to call ahead and get a group rate fifteen minutes before we were planning to show up at an attraction. Tourism boards are often at their best when they’re trying to convince you to visit their area — they can arrange special deals, notify you of upcoming events, and do other things to make sure their area gets your business. I think half the cities in the world have those hop-on-hop-off tour buses these days, and I really don’t think they’re the great deal they’re made out to be. When touring Cardiff, a friend and I snagged a copy of their map and hopped on a public bus that went to basically the same places. Our tour cost literally a tenth of theirs and we didn’t have to figure out what some squawking intercom was saying. Many churches and other religious sites are considered amazing tourist attractions, such as Paris’ Notre-Dame, but are free. Architectural buffs, take h eed: you can see some of the best-preserved buildings just by visiting religious sites during your sightseeing. Cemeteries can also be worth a visit, though you might not think of them at first. But if you’re particularly interested in a particular historical figure, look up where they’re interred: most cemeteries have some beautiful sculpture and can give you a great introduction to an area’s history. Great ideas Thursday! Though in some places I caution you against public transit. For example, in Shanghai we were literally shoved into the subway because it is packed. If you can deal with riding with that many people then it is a lot cheaper than a taxi. I think Tokyo is the same way. They showed a video of a subway station guard shoving people into the carts. I experienced that in Shanghai! Here in Minnesota in the Twin Cities, St. Paul's cathedral is amazing and it is free. It was built around the trun of the 19th century and you can easily spend four hours touring it. They don't build places like it anymore. Any ideas for cheap sightseeing activities at night?I usually have no problems finding cool things to do during the day, but once the museums close and it is too dark to go hiking, I'm at a loss for ideas. But it's a shame to miss out on some GREAT and irreplaceable experiences like seeing Mt. Vernon. Yes, it costs, but it's worth it for the sights, sounds, smells, feelings, and sense of place. You learn things you couldn't get anywhere else, and kids won't forget it. If you want to be frugal, just stay away from the extras like the cafeteria and and the gift shop. Don't deprive yourself of unforgettable tourist and museum experiences - you've paid the cost to get there already - take advantage! * Museums in many European and Asian countries also offer a free day or night, sometimes it's weekly, sometimes monthly. The Middle East many museums are still free or very cheap. * European city tourist offices often offer special cards, eg. a Turin Card in Turin, Italy, which for a dirt-cheap price offers unlimited free public transport, free entry to some museums, discounts to others, etc. * people-watching is still one of the cheapest activities and in Europe and the Middle East most cafes and bars have no problem with you sitting on one coffee or drink for hours while you watch the world go by. * take a picnic compiled of food bought from a local market to a local park or by the sea, and you get to save money on a meal as well as do some people-watching and take in the local colour and action.